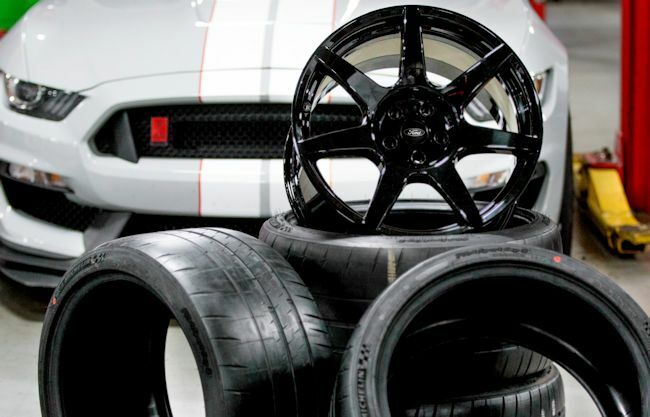 Home » Is the 2016 Mustang GT350R Carbon Fiber wheel suitable for HPDE? Is the 2016 Mustang GT350R Carbon Fiber wheel suitable for HPDE? Driving Enthusiasts planning to use the Shelby GT350 as for open track (“HPDE”) events are eagerly anticipating the availability of the GT350 and all of its features, centered around the 5.2 liter flat-plane V-8 engine. But also (and more importantly for these events) the extraordinary work Ford has put into the suspension of the GT350. Altogether it’s a tremendous package that is by far the most comprehensively designed Mustang ever built, one that totally eclipses and obsoletes the Boss 302 Mustangs of a few years ago (which looks like a Model T sitting next to a GT350 – and we’re speaking as an owner whose Boss 302 is obsoleted by the 2015 Mustang GT with the Track Pack option). But the GT350 is also a Mustang with a weight problem, since the structure of the last Mustang was reused for this car. Comparing two bodies-in-white, you’ll find the same hard points and the same overall size, with a tiny bit less weight. However, add in the new-generation independent suspension and all of the options that are typically snapped up by buyers and you’ll end up with a significantly heavier car than it’s predecessor. Weight is the enemy of track cars, so Ford has taken several steps to (very slightly) reduce weight in the GT350. The new carbon fiber wheels, offered only on the hyper-expressive GT350R model, is one such step. 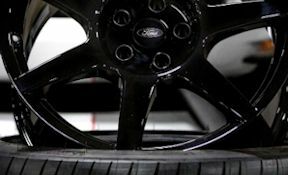 And given Ford’s philosophy that advanced technologies have to “trickle down” to production cars (as Ford has stated for the advanced technologies being developed for the upcoming Ford GT), it’s important that “field experience” is gained so that such wheels can be mass-produced and offered on pedestrian Mustangs and other Fords. Much more durability testing in the outside world is going to be needed, with years of experience, along with further research into manufacturing methods that will significantly drive down the cost. Where better to test but on the racetrack? Ford’s press release below is a fascinating read, with several particularly interesting facts (and we appreciate that information: enthusiasts need to understand). First is fact that the magnetorheological shocks had to be tuned specifically to the ultra light weight of these wheels. That’s expected since shocks work by controlling the velocity of the suspension motion. But for HPDE events, most enthusiasts will want to use a second set of wheels with mounted race rubber. Given that the carbon fiber wheels will certainly have an ungodly price (the internet is full of speculation; we’d throw out the wild guess of $2000/wheel), that second set of wheels will probably be aluminum. Preferably spun or forged aluminum to keep the strength up and weight down. That suggests that then the shock tuning will be less than optimal with the replacement wheels since the unsprung mass will now be heavier. Don’t misinterpret us: magnetorheological shocks are “miracle” shocks, the ultimate shock, and it’s a tremendous opportunity that for us that Ford is using them on the GT350 (and we’d like to see them as an option on the GT, since the 2016 Camaro will offer them as an option on their model equivalent to the Mustang GT). Short of turning the GT350R into an actual race care, there should be no reason why an enthusiast would ever want to replace them.